Our selection of roofing blades spans the gamut, including bowtie, utility, and hook blades, as well as a wide range of dispensers and accessories. 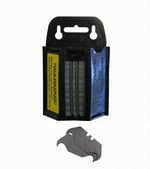 All of our blades are available in packs of 5, and for the ultimate in durable and safe portability, we also offer a selection of hook blade dispensers. 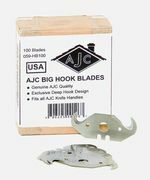 You may also buy blades in convenient bulk packs, including our AJC Big Hook™ Blades, sold in packs of 100, as well as our standard utility blades, sold in a bulk dispenser of 100. Our inventory also includes the AJC bowtie blades, crafted from the toughest steel and featuring four sharpened edges for maximum usage, as well as our Sheffield English hook blades. If you have any questions about our roofing blades, contact us – we’d love to hear from you! 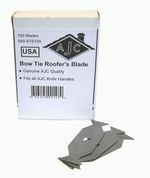 The AJC bowtie blades are heavy-duty roofing blades with four sharpened edges for maximum usage and are made from the toughest steel. These roofing bowtie blades fit both the 57-MCGA and 057-RK3 roofing knifes. Buy in a bulk pack of 100 right here! Our genuine English hook blade dispenser is now available in boxes of 100! They are made in Sheffield, England and are available at a terrific price! Shop securely online below. 2 Pack Edge Trimmer Blades for 050-DC Edge Trimmer.